Easy dinners are a favorite for this busy mama. 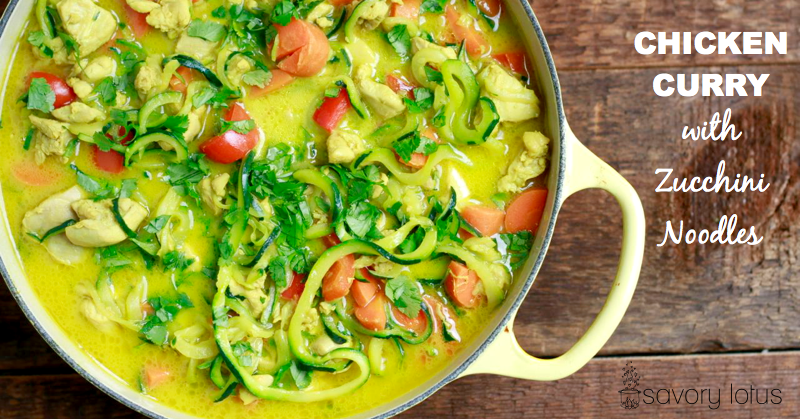 This Chicken Curry with Zucchini Noodles has been showing up on our dinner table quite often lately. Don’t you just love a meal that the whole family will eat? No one complains. No one refuses to it it. AND IT’S HEALTHY! 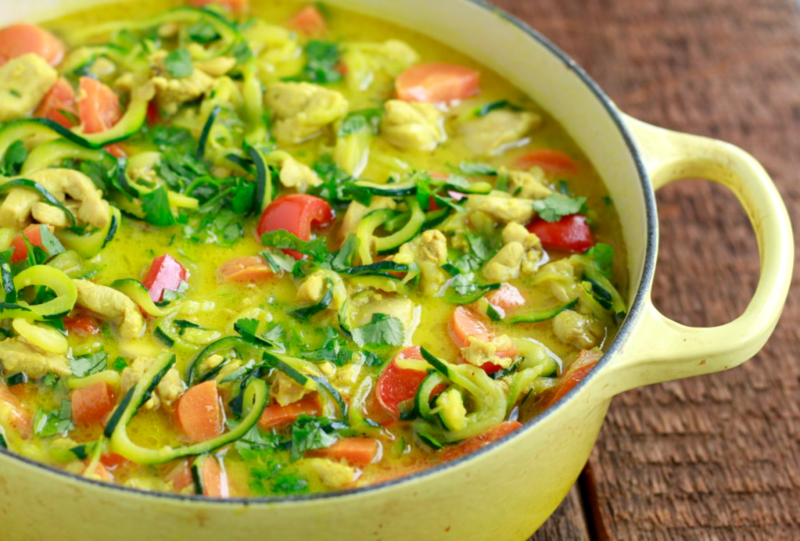 This Chicken Curry with Zucchini Noodles has been a big hit around here. And I am super excited to share the recipe with you today. You can’t really beat a one-pot kind of meal. You just throw it all in and let it do it’s thing. Easy peasy! I take every opportunity to load my family up with more vegetables. I added carrots and red peppers for flavor and color. The zucchini noodles are fun to eat. The chicken gives you your protein. And the coconut milk and spices make this dish out-of-this-world delicious. You’ll notice that I snuck in a some homemade bone broth for a little added nourishment. Oh, and I used my vegetable spiralizer to easily cut my zucchinis into noodles. It works like a charm! Hope your family loves it as much as mine does! Combine turmeric, coriander, cumin, salt, chopped garlic, and grated ginger in a small bowl. Set aside. Melt coconut oil in a large skillet or pot over medium/high heat. Saute chicken pieces for 5-7 minutes, until no longer pink on the outside. Add spices, stir to combine, and cook for another minute. Then add bone broth and coconut milk. Stir to combine. Add in carrots and red pepper. Bring to a boil then turn down heat and simmer for 5 minutes. The add zucchini noodles and cook for another 5 minutes, until chicken is fully cooked. Squeeze in lemon juice. Garnish with fresh cilantro. And dig in! Off to give this recipe a try…. 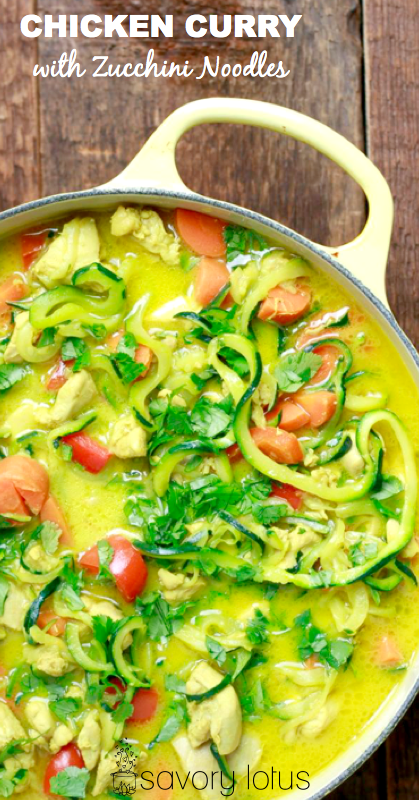 I made the chicken curry with zucchini noddles yesterday for my boyfriends daughter who recently had a baby. I wanted to make something that was healthy easy and beautiful, and your recipe made the cut for me. I really enjoyed the easy step by step guide. Today I was told how delicious it tasted , and there is enough for another meal. Well the next batch is for me ! This will definitely be in my recipe file. Thanks so much for the inspiration. What a wonderful thing to do for a new family. I am so glad that they enjoyed it. Thanks for the feedback! I made this today for an early lunch and it was delicious! Wanted to make something with turmeric; and this recipe fit what I was searching for plus, since it has ginger and all the other spices. Tasted as good as I had imagined. Thank you so much for sharing this recipe. I made this today and it is so delicious! I’ve been trying different “healthy” recipes, this one really delivers good flavor. Thank you. I love how healthy and easy this dish is to make, too, it’s definitely a keeper. Oh, yay! So glad you liked it. This is one of my favorite quick dinners. 🙂 Thanks for taking the time to leave some feedback. Love this Recipe!!!! I am doing Fitness pal so I was wondering if you had the number of calories and any other nutritional info on this recipe ? Thank you! I will be making this again! Sorry! I do not calculate. But you can use https://www.myfitnesspal.com/ to do so. Hope that helps. it would be helpful to have calorie information per oz on the recipie. Simple but amazingly flavorful meal! Its even better the second day! I would recommend to use a few more garlic cloves and heaping tablespoons of the spices. Delicious! I accidentally gave it 4 stars but meant to give 5! Wondering why it doesn’t actually have some curry in it. 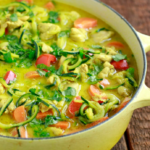 I liked the recipe and found it to be colorful and flavorful. I understand about making things family friendly but wondered if it originally had some curry or sriracha in it. Hi just wondering if it freezes well? 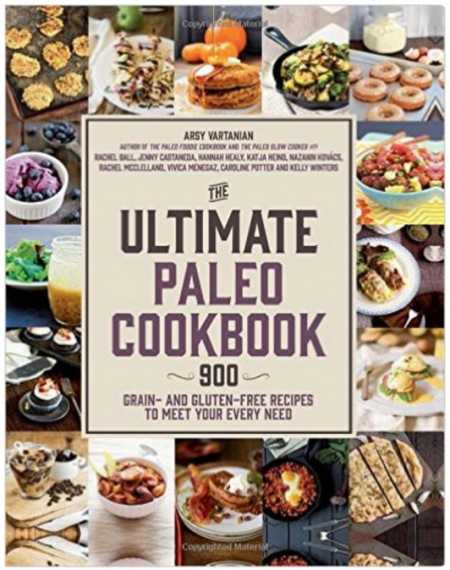 I am looking at batch cooking Paleo meals. I haven’t tried freezing this yet so I can’t say for sure. But my experience has been that most soups and stews do freeze well. The zucchini noodles may break apart a bit. You could just do chopped zucchini instead of that bothers you. Thanks a lot for the recipe. Like another comment, I made it for somebody who just had a baby and was told it was AMAZING!!! 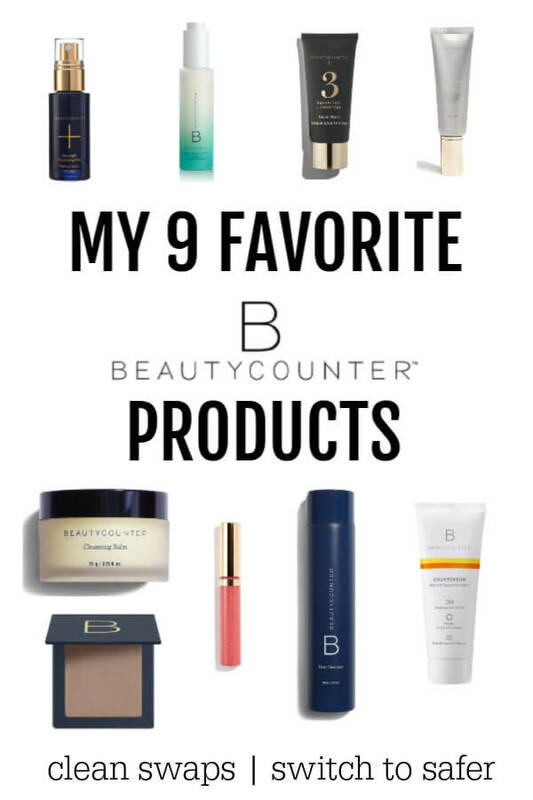 (with the upper case and exclamation points!). I just put a little less spices than the recipe calls but otherwise pretty much followed it. This recipe is excellent. Add some fresh spicy peppers and Garam Masala to give it a little kick and then top it off with some chopped cilantro to make it amazing. Thanks. YUM! Your add ons sound amazing. I love the Indian flavors. Its perfect just as its written. I have made it twice now, & added kale for bulk & to get more veggies in. So good! Yay! Glad you enjoyed it. And yes to more veggies! !